Officer Adam Vasquez is a poster child for the type of people who get hired to become today’s so called “Peace Officers”. Out of control and knowing nothing about protecting and serving this menace to society needs to go back to school. The main issue here is this bully has no business wearing the uniform, having any authority and worse of all possessing deadly force. Rosenberg, TX — An infuriating video taken by a Texas woman shows a Rosenberg police officer Adam Vasquez attack’s her — for her own protection. The victim, Sydney Tawater was standing in her own doorway when Rosenberg police officer Adam Vasquez became angry that she was filming him. According to Tawater, officers were fine with her standing outside of her doorway — until she began filming. When officer Adam Vasquez noticed Tawater filming him, he lost it. “Get inside, move!” he says. “She was the one who was being assaulted,” Officer Adam Vasquez says. Clearly illustrating the contrived nature of his claim, one officer is seen walking right past Tawater as Officer Adam Vasquez attempts to violate her rights as she was clearly no threat. When Tawater does not immediately go inside and prostrate herself to the officer’s unlawful order, Officer Adam Vasquez attacks her. The officer then tried to justify this assault by claiming Tawater was a victim of assault. Officer Adam Vasquez is a Rosenberg native. He graduated from BF Terry High School. He holds an Associate’s Degree and Peace Officer Certification from Wharton County Junior College. In 2013, Officer Adam Vasquez was hired by the Rosenberg Police Department as a Municipal Jailer. He was employed as jailer for four months to broaden his police experience. He then applied for patrol where he was offered the position of Probationary Police Officer and went through the Rosenberg Police Field Training program (FTO program). He successfully completed the FTO program in 2014. Officer Adam Vasquez explained his most enjoyable time during the FTO period, was having everyone to include; jailers,dispatchers, FTO’s, and administrators, who were willing to help him out when he had questions or concerns. Well he sure needs to go back to school on “Rights” and how to deescalate a situation. 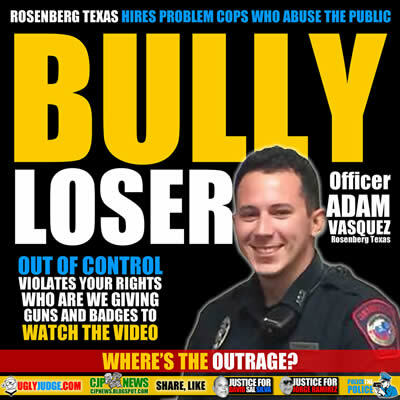 This could have turned out much worse, officer Adam Vasquez is a perfect example of the type of Bully and loser Police departments all over America hire and release out in public to abuse, violate and harm people.